365 by Whole Foods Market, the smaller, less-expensive little sibling of the organic-foods grocer, will open its first location in Los Angeles next month, its second in Lake Oswego, Ore., in July, and the third in Bellevue this fall. 365 by Whole Foods Market, the smaller, less-expensive little sibling of the organic-foods grocer, will be inching up the West Coast this summer. Its first location is scheduled to open May 25 in Los Angeles, with a second opening July 14 in Lake Oswego, Ore., the company said this week. The third, in Bellevue Square, is to open this fall, though no date has been set yet. The company plans to open up to 10 additional 365 stores in 2017. The smaller-format stores, a fraction of the size of regular Whole Foods stores and costing less to build, represent the retailer’s bid to remain competitive at a time when everyone from Wal-Mart to Costco to Krogeris expanding organics selections, and specialty stores such as Trader Joe’s are chomping away at its market share. The 365 stores are part of the efforts of the Austin, Texas-based chain to turn all that around. Whole Foods executives hope the smaller stores will reach a broader customer base, including more value-conscious shoppers and those wanting “a less complicated shopping experience,” said Joe Rogoff, Whole Foods’ regional president for the Pacific Northwest. In a bid to counter its “Whole Paycheck” reputation, the 365 stores will include products mostly from value- and moderately priced lines. “You won’t find a $50 balsamic vinegar on the shelves,” Rogoff said. 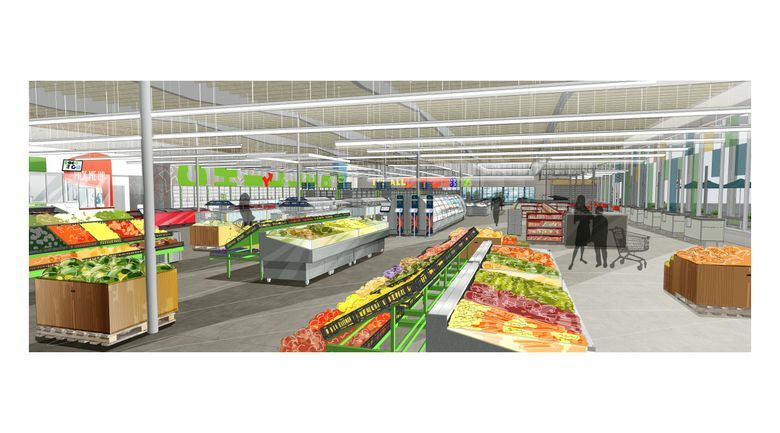 The stores will have prepared foods, hot bars and salad bars, but no counter service. A large produce section — “one of our signatures as a company,” Rogoff said — will also be part of the 365 stores. But prices on produce and other items will be lower than at the regular, larger store, he said. That’s because building and running the 365 stores will cost less than the regular Whole Foods stores. The 365 stores will be about 25,000 to 35,000 square feet. The Bellevue Square store will be about 30,000 square feet. That’s smaller than the regular stores, which run about 35,000 to 55,000 square feet, most of them at least 40,000. The cost of building a 365 store is only about 60 percent of a full-size store, since there won’t be a full kitchen, nor the same kind of meat-cutting or fishmongering operations. The staff will also be smaller: 80 to 100 employees versus 150 to 600 for the full-sized stores. Each store will also have one or two “Friends of 365” — local vendors who set up shop within the stores. Tattoo parlors and record shops were among the ideas the company reportedly considered. Rogoff says that, at least in its first stores, those “friends” won’t offer anything other than food or beverages. The Bellevue 365 store has space for one such “friend” — “and potentially one more if we get creative. And we’re trying hard to be creative,” he said. Rogoff said the company is “in conversation with a very well known local restaurateur who has a good concept,” but declined to say more. It’s unclear to him how well the plan will work.